In November 2014, after traveling 10 years and hundreds of millions of miles, a European spacecraft will touch down on a two-and-a-half-mile-wide ball of ice and dust as it hurtles through space towards the sun. And if all goes according to plan, this unprecedented feat could finally give us what we need to understand the origins of life on Earth. It's just the "according to plan" that's the tricky part. Until now, any attempt at studying a comet has involved either flying by them in attempt to match their speed, or literally crashing into them and just sort of hoping that the material breaking off will offer some sort of insight. This new spacecraft, however, is a much more subtle creature; it's spent the past 10 years meticulously stalking its comet prey. The spacecraft, dubbed Rosetta, was actually launched in 2004 and has been hibernating in sleep mode since 2011 to save power as it waits along the outer-edge of the solar system for its final destination, the ever-so-catchily named Churyumov-Gerasimenko comet. Then, at 10am on January 20 (just over a month from now) Rosetta will wake up from its little nap and get ready catch the comet as it comes hurtling by. As soon as it's awake, Rosetta will immediately start taking navigational sightings of the comet, giving scientists the information they need to take note of any unexpected shift in the comet's path and make one final course correction before go-time. Then, by August, the spacecraft will finally have made its way into Churyumov Gerasimenko's direct vicinity, at which point it will circle the comet and construct a map of its surface. By November, the map will have been made, the course plotted, and Rosetta's little lander named Philae will be sent to settle on down. Circling the comet is no routine attempt at orbit, though. Churyumov Gerasimenko barely has any gravity, so Rosetta is going to have to use its blasters to maintain any sort of orbit around it. 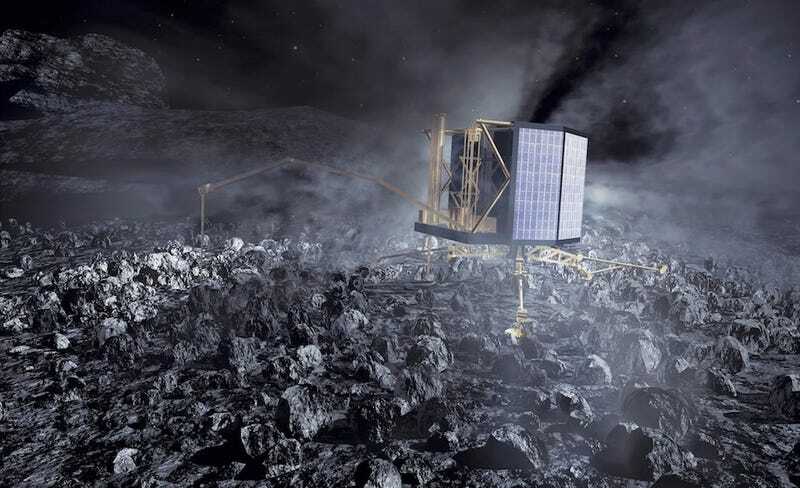 What's more, Raw Story notes that as Rosetta starts getting closer to the sun, the "plumes of vapour and gas pouring off 67P/Churyumov-Gerasimenko's surface will hit the probe's 14-metre-long solar panels like winds billowing out a sail." So keeping a steady circle is going to be a highly precarious undertaking. Nothing like this has ever even been attempted outside of 1998's Deep Impactand Armageddon, and there's a whole host of potential problems that come with such uncharted territory. For one, the scientists involved in the mission don't actually have any idea what Churyumov-Gerasimenko's surface is actually like, explaining to The Telegraph that it could resemble either "concrete or candyfloss." Which, depending on your cotton candy preferences, could be a pretty huge disparity. There's also the teeny tiny little issue of the comet being essentially void of, you know, gravity. So in order to secure itself, the lander is going to have to shoot a spear into the speeding comet's surface and quite literally hitch a ride. It is very unusual to put something into hibernation when it has never been used before. To do it with something you've just spent several hundred million euros on, to switch it off and let it drift into planetary space for two years without any contact is totally unprecedented. If the alarm fails and Rosetta does not rouse itself, we will be in trouble. On the day, we will all be waiting in the control room, anxious to hear a signal from Rosetta. However, it will take several hours for the craft to complete its wakeup procedures before it transmits a message to Earth to let us know it is alive and well. It will be a nerve-wracking day. Considering how risky this bout of hibernation is, energy conservation might seem like a strange priority. It's not by choice, though. Rosetta is a largely solar-powered beast, and being four-and-a-half times the Earth's distance from the sun means that any solar rays it might catch would be far too weak to provide any lasting power. So let's just pray that Rosetta's a morning person. Of course, with such a high risk comes the potential for major reward. As the comet comes closer to the Sun, it heats up and becomes what scientists call "active," a state in which the comet's ice starts to melt and sheds gas. And because the comet has remained virtually unaffected since the solar system's creation billions of years ago, the team is hoping that, by studying the ways in which the comet changes as it approaches the sun, they'll be able to gain a deeper understanding of how Earth itself formed.